Brian Vaszily is the author of the #1 international bestseller, The 9 Intense Experiences, named one of the all-time top 5 best motivational books. 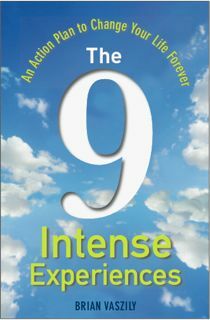 The 9 Intense Experiences IS what you are seeking! A #1 international bestseller in multiple countries (see below) in multiple categories - including Happiness, Spirituality, Personal Growth, Success, and Motivaton -- The 9 Intense Experiences has been named one of the All Time Best 5 Motivational Books! The 9 Intense Experiences is authored by Brian Vaszily, one of today's most respected life transformation visionaries, motivational speakers, and life coaches who has been featured on CBS, ABC, NBC and Fox, and more. 'Top 5 Books Of All Time!'" What are the world's nine MOST life-changing experiences ... The 9 Intense Experiences you can conveniently engage in at any time that are proven to most powerfully and rapidly clear through your internal barriers so you achieve the maximum success, motivation, and happiness that should be yours? As you will discover, virtually everyone today is dangerously neglecting ALL nine of these Intense Experiences. Extensive research now proves this is why adults today feel overwhelmed, stressed out, worried, depressed, and "stuck in a rut" in different areas of life. These are the 9 most transformative experiences that people in all cultures throughout the world and throughout the rest of human history EXCEPT for contemporary times (particularly the last 20 years, for reasons you will easily identify with) actively, intentionally, and routinely engaged in. You will quickly discover that your engagement in these nine amazing (and enjoyable!) experiences is precisely what has been missing from your life. And you will discover that by delving into these 9 Intense Experiences you will -- rapidly, permanently, and for real, because this is not the latest fad but based on the most widely proven principles from human history and contemporary science -- get out of the ruts and achieve the life you know deep inside you ought to be living! And DO NOT MISS your FREE Subscription to Brian Vaszily's Intense Experiences Newsletter Below ... Read by Hundreds of Thousands Worldwide, It Is Now the World's Most Popular Motivational Articles Newsletter!